In other words, the 5500-EZ form is used to report your Solo 401k annual holdings. When is form 5500-EZ due? The 5500-EZ is due by July 31st but only if your Solo 401k plan had $250,000 or more in assets at the end of the calendar year last year. Example: If on December 31st, 2018 your Solo 401k had $250,000 or more in total assets, then you would file your form 5500-EZ by July 31st, 2019. If you just set up your plan this year, you don’t need to file your 5500-EZ until next year. The 5500-EZ is filed for the previous calendar year. Who must file form 5500-EZ? The 5500-EZ must be filed if your Solo 401k had more than $250,000 in total assets during the previous calendar year or if last year was the final year of your plan. If you have less than $250,000 in plan assets, you don’t need to file the 5500-EZ. If last year was the FINAL year of your Solo 401k (you closed down your business or cancelled your plan completely), then you MUST file a 5500-EZ, even if you had less than $250,000 in total plan assets. How do I know my total Solo 401k plan asset value? Real estate (generally a broker opinion letter or appraisal is desired to get an accurate property price – if this is your first year of ownership, you can generally use the price listed on your closing documents). Helpful Hint: Make sure you have the Solo 401k Adoption Agreement provided to you when you set up your plan with Nabers Group, and a record of your cumulative plan assets before you get started. • Check box A(1) if this is the first filing for this plan. This checkbox is only for your very first 5500-EZ. • Check box A(2) if you are filing an amended Form 5500-EZ to correct errors and/or omissions in a previously filed annual return. • Check box A(3) if you closed your Solo 401k and distributed all the assets. If none of these situations apply to you, do not check any boxes. If this your 2nd, 3rd, 4th (etc) year filing the 5500-EZ, you don’t need to check any box in section 1A. 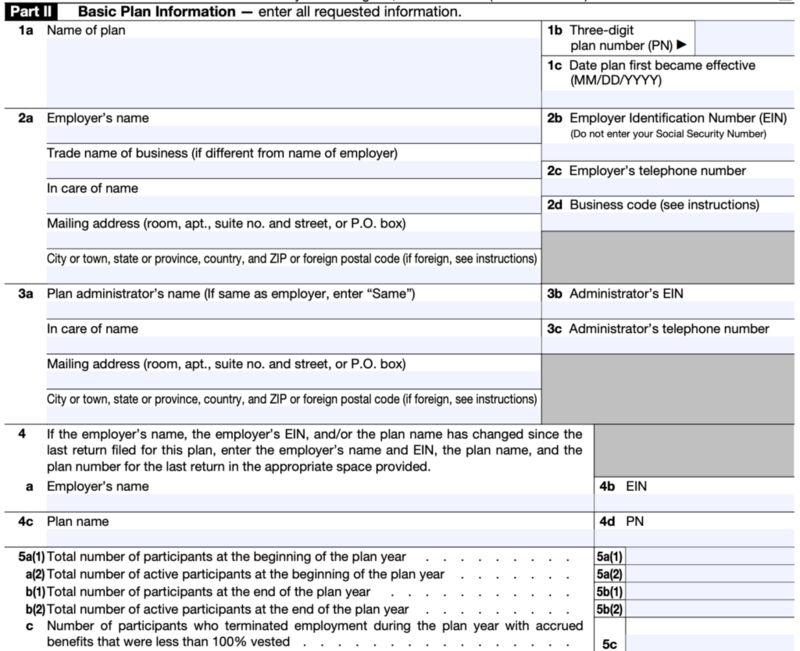 Helpful hint: If this isn’t your first year filing form 5500-EZ and your business and/or plan information hasn’t changed, you can generally input the same information as last year. Use the Solo 401k Adoption Agreement provided to you by the Nabers Group team to complete the plan information for questions 1a-3c. NOTE: If your adopting employer is a Sole Proprietorship, you must obtain an EIN from the IRS. Social Security Numbers are NOT allowed on the 5500-EZ. If you restated your plan or changed your Solo 401k adopting employer since your last 5500-EZ filing, and your old plan had a different name, you’ll need to complete questions 4a-4d as applicable. If you restated your plan to the Solo 401k by Nabers Group and you already had a tax ID number assigned to your trust, only input the information here if your plan name and plan number have changed with the restatement. If you restated your plan to the Solo 401k by Nabers Group and you didn’t have a tax ID number assigned to your trust, you’ll probably input your new plan name and plan number here. For example: if you previously had an individual 401k plan with a brokerage house (e.g. Fidelity, Schwab, Merrill Lynch, etc), or another document provider, you most likely restated your plan to the Solo 401k by Nabers Group when you set up your plan with us. 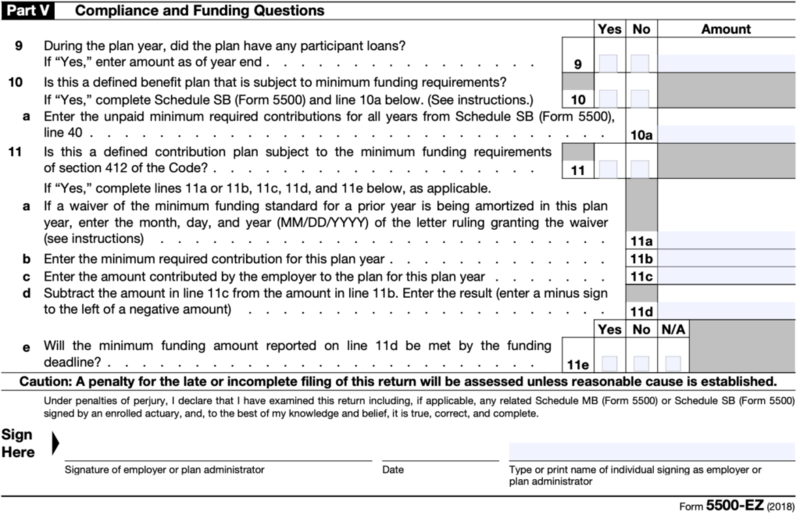 If your plan name and number changed with the restatement, input your old plan name and plan number in section 4b and 4c, so the IRS can keep track that this is the same business filing form 5500-EZ for its retirement plan, and that the documents have simply restated and with a new name/plan number. Similarly, if you changed the Adopting Employer connected to the plan since your last 5500-EZ filing, and your company EIN has changed, you should complete this section. If only the Employer and/or employer identification number (EIN) has changed, update line 4a and 4b (and leave 4c and 4d blank). If nothing has changed on your plan and your employer identification number, employer information, plan name and plan number remain the same – leave section 4a-4d blank. Enter your participant information in questions 5a-5c. Unless you got married, divorced or fired your spouse from working in your business, the number of participants at the beginning and end of a plan year will generally be the same. In this section, you’ll enter your total plan assets at the beginning and end of the calendar year. The easiest way to do this is to tally your cumulative assets as of January 1st last year and then add them up again for December 31st last year. If you are completing this filing because last year was the final year for your Solo 401k, the total plan assets may be less than $250,000. Enter “Total plan liabilities”. From the IRS instructions on completing the 5500-EZ: “Liabilities include but are not limited to benefit claims payable, operating payables, acquisition indebtedness, and other liabilities. Do not include the value of future distributions that will be made to participants.” (Source). Enter “Net plan assets” for the beginning and end of the year. You can find this number by subtracting the assets and liabilities at the beginning and end of the year, and enter in the total amount. Only enter contributions for 2018 in column 2, for “end of year”. 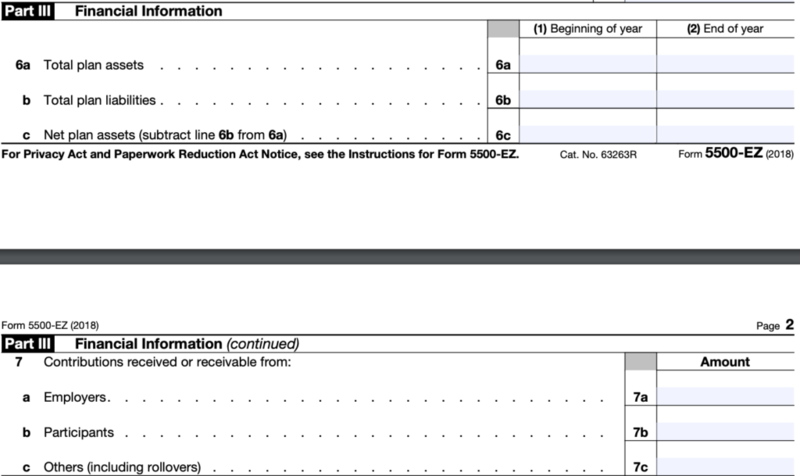 Do not include 2018 contributions in column 1 (beginning of year) for line 6. For questions 7a-7c, enter your information for how much you contributed to your Solo 401k plan last year. Line 7a: Enter the total employer cash contributions for the year. There is no employer match with the Solo 401k. The employer profit-sharing contributions are based on a percentage of earned income of the business above and beyond the employee elective deferral limit. Line 7b: Enter the total employee elective deferral cash contributions for the year. Employee elective deferrals can be either pre-tax(non-Roth) or after tax (Roth). If you made voluntary after-tax contributions, you’ll enter them here. Line 7c: Enter the amount of all transfers or rollovers received during the calendar year from other plans valued on the date of contribution. This does not include income or contributions. Any income put directly into the plan is a contribution, not a rollover. Rollovers don’t count toward contribution limits though they do count toward total plan assets. If you roll in $250k or any amount that raises your plan assets to $250,000 or more, you must file a 5500-EZ. 2R – participant-directed brokerage accounts 2S – plan provides for automatic enrollment in plan that has employee contributions deducted from payroll. For example, if you and your spouse opened a Fidelity non-prototype retirement account as a brokerage account for your Solo 401k plan, you most likely will include “2R” as each brokerage account is “participant-directed” according to Fidelity’s guidelines. For this section, check “Yes” on question 9 if the Solo 401k had any outstanding participant loans. You must also check “Yes” if you had an already existing outstanding loan during the reporting calendar year. Make sure to enter the amount outstanding as of the end of the calendar year for your 5500-EZ filing. For line 10, you can generally check “No” since the Solo 401k by Nabers Group is a defined contribution, not a defined benefit plan. The Solo 401k by Nabers Group affords you complete flexibility in your contributions, without a minimum funding requirement. Therefore, line 11 can be “no” and the remainder of this section is not applicable. Sign and date the bottom of the form and you’re done! Can I Get an Extension on the 5500-EZ? You are allowed a one-time extension on filing your 5500-EZ by completing form 5558. Where Do I Submit Form 5500-EZ? The 5500-EZ is a form filed by one-participant plans a to satisfy certain annual reporting and filing obligations imposed by the IRS. Do I have to file the 5500-EZ? You are only required to file a 5500-EZ once the plan assets in your Solo 401k reach $250,000 or greater. The $250,000 includes all plan assets. For example, if you have $30,000 in the bank and own a rental house worth $240,000, you need to file a 5500-EZ. The form needs to postmarked by no later than July 31st. We recommend sending your form via USPS priority mail or another shipping method that provides you with a tracking number. There is no fee to pay to file this form. It is an informational filing only. What year do I file in? The 5500-EZ is due on July 31st for the prior year. For example, if your plan assets exceeded $250,000 on December 31st 2018, you need to file the 5500-EZ by July 31st 2019. Do I need to attach any bank account statements, receipts, or other paperwork with this form? You do not need to attach any extra documents when filing the 5500-EZ. Can I get an extension to file my 5500-EZ? A one-time extension to file Form 5500-EZ (up to 2 ½ months) may be obtained by filing Form 5558 on or before July 31st. For help with this form, please contact your CPA. If you don’t have a CPA able to assist you, just reach out to us and we can provide a CPA resource list of those familiar with the Solo 401k and 5500-EZ filing. I didn’t file my form 5500-EZ in time. What should I do? You may be eligible for penalty relief under Revenue Procedure 2015-32. You’ll find instructions for how to file a late 5500-EZ on the IRS website at https://www.irs.gov/retirement-plans/penalty-relief-program-for-form-5500-ez-late-filers. We recommend utilizing your CPA to complete this filing. If you don’t have a CPA able to assist you, just reach out to us and we can provide a CPA resource list of those familiar with the Solo 401k and 5500-EZ filing. How do I submit an amended 5500-EZ? You must submit the amended return using the paper Form 5500-EZ with the IRS. Help! I don’t have a CPA to help me file this form. No problem! Just reach out to us and we can provide a CPA resource list of those familiar with the Solo 401k and 5500-EZ filing. DISCLAIMER: Please note that this guide is for educational and informational purposes only. The guide is not intended nor should not it be considered a replacement for tax, legal or investment advice. Always consult your tax advisor, CPA and/or legal counsel before filing.